If you need to dispose of a large quantity of concrete or other materials Dumpster Market can make the process fast, easy and nearly painless. 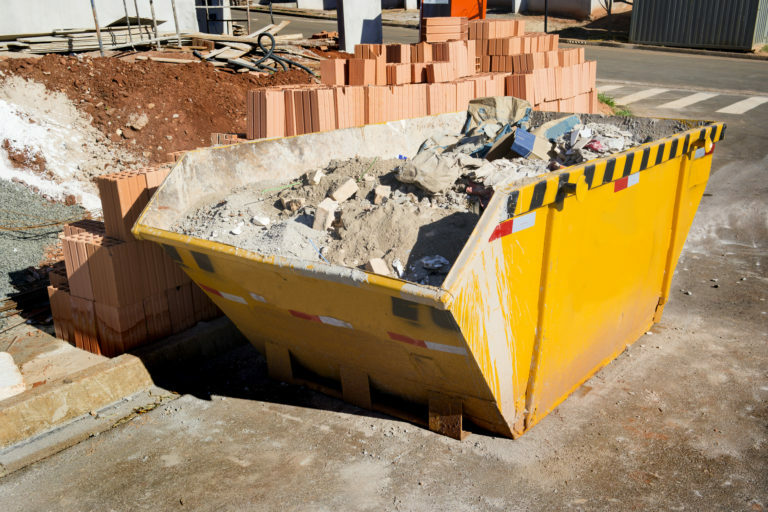 We can help you find a concrete dumpster to efficiently remove tough debris such as asphalt, dirt or concrete. If you are completing a demolition or driveway replacement use our containers to assist with your project. We make ordering a concrete dumpster hassle-free with our convenient online ordering process. From the convenience of your home, office or vehicle, you can use our easy-to-navigate website to see a range of price points and pick the one that is most cost-effective for you. There is no need to spend hours calling every dumpster provider in your area to compare prices, services and availability. Using our website you can find the lowest concrete dumpster cost and locate the right heavy materials or concrete disposal dumpster for your project. • Affordable: Compare the best dumpster prices in your area. • Fast: We can deliver and pick up your dumpster rental whenever is ideal for you. • Convenient: Choose from multiple rental container sizes. What Can Go in a Heavy Debris Dumpster? 1) Clean Concrete: Clean concrete is rid of trash, excessive quantities of metal, roots, or any other kinds of contaminants. Painted concrete is acceptable as long as the paint is not lead-based. 2) Mixed Heavy Debris: Any combination of clean concrete and other heavy materials such as asphalt, brick, or block. We will happily help you dispose of clean concrete and other types of heavy debris. The maximum weight limit for loads such as these is 10 tons. You can pick the right size dumpster to meet the exact requirements of your job, allowing you to dispose of concrete or other materials efficiently and affordably. A 10-yard dumpster is generally recommended for concrete waste disposal but you could also rent a 20-yard dumpster and fill it halfway. Search now to see our lowest-priced options for concrete dumpsters. Sign up for Dumpster Market Professional to get a 2% rebate on every order! for mixed debris (concrete and other heavy debris). These dumpsters can be filled with any heavy construction debris. **Please check with us if you think your material might qualify as being "Clean Fill" you may be eligible for a lower price. Please check with us if you think your material might qualify as being "clean fill" because you may be eligible for a lower price. These dumpsters are specially priced when filled with a single material type because the material can be diverted from the landfill and put to effective use. Dirt, concrete and brick may all qualify as clean fill. Let us know if you have any questions about this type. Call our toll-free number, fill out and submit our convenient online question form, or instant-chat with us by clicking on the green-and-white button below. Our helpful staff members are ready to help. You lose nothing by asking and you could enjoy substantial savings!